Born in Chicago on June 15, 1953, Ana Castillo is a universally celebrated poet, novelist, short fiction writer, essayist, editor, playwright, translator and independent scholar. Her novel, Sapogonia, was a New York Times “Notable Book of the Year” and her first work of fiction, The Mixquiahuala Letters, received an American Book Award from the Before Columbus Foundation. Other award-winning and bestselling novels include Give It to Me, which was the 2014 winner of the Best Bisexual Fiction from the LAMBDA Foundation, So Far From God, The Guardians and Peel My Love Like an Onion. Massacre of the Dreamers, her classic, award-winning collection of essays celebrated its 20th anniversary with an updated edition released in 2014 and her award winning novel in verse, Watercolor Women, Opaque Men will be re-released in fall 2016 by Northwestern University Press in a deluxe new edition. Calling her “the most daring and experimental of Latino novelists,” Commonwealth contributor Ilan Stavans noted that Castillo’s “desire to find creative alternatives and to take risks is admirable.” Her work in poetry and prose is at once highly innovative and based on established oral and literary traditions. Currently, Castillo is editor of La Tolteca, an arts and literary ‘zine dedicated to the advancement of a world without borders and censorship. She also sits on the advisory board of the new American Writers Museum in Washington D.C. With an M.A from the University of Chicago and a Ph.D. from University of Bremen, Germany in American Studies, the leading literary luminary received an honorary doctorate from Colby College. In keeping with long list of ground-breaking achievements, she was the first Sor Juana Inés de la Cruz Endowed Chair at DePaul University, held The Martin Luther King, Jr Distinguished Visiting Scholar post at M.I.T. and was the Poet-in-Residence at Westminster College. In 2013 she was the recipient of the American Studies Association Gloria Anzaldúa Prize, given to an independent scholar. A year later, Dr. Castillo held the Lund-Gil Endowed Chair at Dominican University in Illinois. In June 2015, Castillo was given the Lifetime Achievement Award in literature for her “literary contributions to the Latino/a community, and commitment to the betterment of our younger generations” by Latina 50 Plus, a motivational organization based in the Bronx, New York. Among the other accolades which have been given to her in acknowledgment of her lifetime commitment to excellence in arts and letters are a Carl Sandburg Award, a Mountains and Plains Booksellers Award, and fellowships from the National Endowment for the Arts in both fiction and poetry. Castillo was also awarded a 1998 Sor Juana Achievement Award by the Mexican Fine Arts Center Museum in Chicago. She is still defiantly proud wears it as a badge of honor that two of her books, So Far From God and Loverboys, were placed on the list of banned book issued by the Tuscon Unified School District in Arizona during its pogrom against ethnic literature the districts white administrators deemed “subversive” and unpatriotic. Castillo has been profiled and interviewed widely on a slew of national electronic media outlets, including National Public Radio and the History Channel, and was also radio-essayist with NPR in Chicago. She recently joined the Bread Loaf faculty with Middlebury College in Santa Fe, New Mexico where she teaches creative non-fiction. As a university instructor, she also teaches in the MFA summer programs at the American Indian Institute of the Arts, also in Santa Fe. Her new book, Black Dove, is a highly charged personal memoir that takes its title from a popular Mexican ranchera song about heartbreak and disappointment that comes as a result of loving too much. It draws extensively on her life as the daughter of a Mexican Indian mother who was born in Nebraska, sent back to Mexico in 1929 with the illegal repatriations of U.S. citizens. According to Castillo’s account, her mother then made her way back to the U.S. Her reality was also colored by the fact that her father was Mexican-American. Against this backdrop of a traditional home which was, in many ways, the antithesis of what was happening across the country during the 1970s. In this context, it becomes apparent that Castillo defied convention in becoming a writer and a feminist. A generation later, her mother’s crooning mariachi lyrics resonate once again. Castillo—now an established Chicana novelist, playwright, and scholar—witnesses her own son’s spiraling adulthood and eventual incarceration. Standing in the stifling courtroom, Castillo describes a scene that could be any mother’s worst nightmare. But in a country of glaring and stacked statistics, it is a heart-wrenching, soul-crushing experience especially reserved for mothers like her: the inner-city mothers, the single mothers, the mothers of brown sons. With fierce intelligence, raw honesty, startling humor, and love, Castillo weaves intergenerational stories traveling from Mexico City to Chicago. She writes of her family’s history in Mexico and America, their lives of hard-work and poverty, and examines her feelings of isolation, loneliness, and otherness. She opens up, for the first time, about the love of her life, a woman who left her heart-broken, and writes about the men in her life who often disappointed her. She writes of the tenderness she feels for her son and her search for spiritual and personal fulfillment. And, in doing so, she narrates some of America’s most heated political debates and addresses glaringly unremediated social injustices through the oft-neglected lens of motherhood and family. 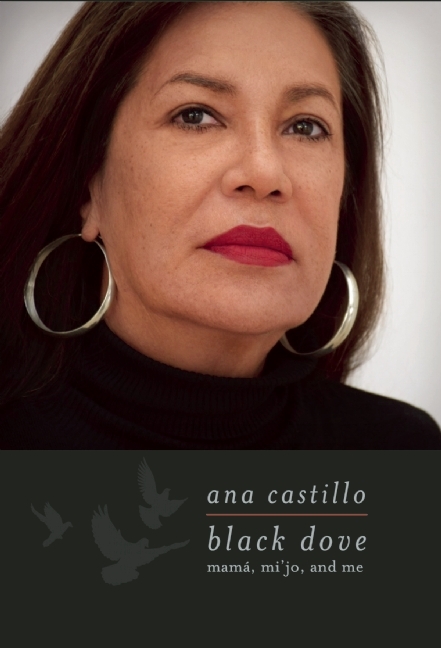 Black Dove, issued by The Feminist Press is in keeping with Castillo’s vanguard status a visionary risk taker. It was, after all, she who brought the word “Xicanisma” into the standard lexicon of academia and Chicano studies in particular. In the 1980s, when her pioneering, provocative still very relevant Massacre of Dreamers was originally published, using the “x” was still considered a radical departure. Today, students who actually have her to thank—are taking her effort to develop terminology with which to discuss Otherness and the relative gender issues that are part of that critical discussion even one step further. It is increasingly common, for example, to see references to “Xicanx” or “Latinx” identity. Using the neutral “x” on the end an term creates a less coded imposition. No longer is a reader constrained by the subliminal messaging. And writers no longer have to wring their hands over using the clunky @ symbol or the even clunkier “o/a” or “a/o” to represent both Chicana and Chicano gender identities. Castillo presented her work at various places in Los Angeles as part of the AWP (Association of Writers and Writing Programs) 2016 Annual Conference held in Los Angeles recently, including the combined Tayo Literary Magazine and The Feminist Press reading with Kenji C. Lui, Angela Peñaredondo and Rajiv Mohabir at Visual Communications in Little Tokyo.